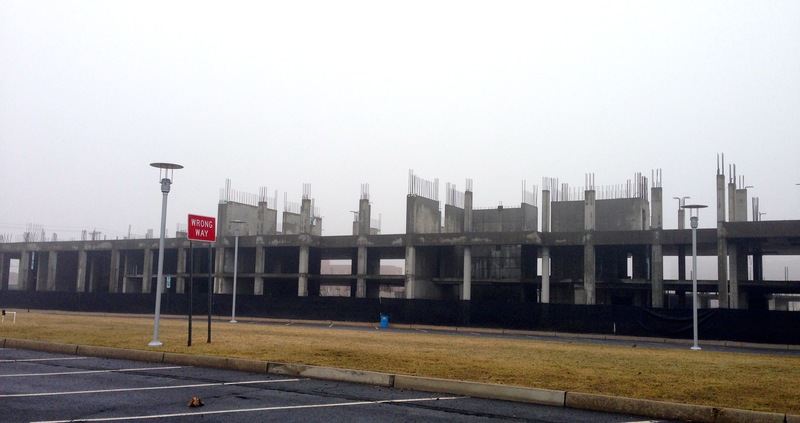 The unfinished Esperanza on Ocean Avenue in Asbury Park. March 26, 2015. By Paul Goldfinger © Click to enlarge. Point well made. No more condos. Isn’t this the site of a crumbling, unfinished condo project they blew up several years ago? Oh yes, we need more condos in the area. Makes for a good place to sell drugs at night. I know everyone says no more condos, but they seem to be selling well in AP (I am against more in OG, unless they put in parking and meet the height and HPC standards). The last condos built in AP sold out in 1 day I think. Times and AP are not the same as in 2011! Doug. The north end condos in AP were slow to sell. Phase two of the Wesley Lake condos never got off the ground, so I don’t know about your “selling well” idea re: AP. But AP is much different than OG. IN AP, developers are trying to promote it as New Jersey’s Brooklyn. But that seems to be a stretch; yet there are more condo’s to be built downtown in Asbury, and it may well become Brooklyn south. This is 1101 Ocean Avenue in Asbury Park. Two failed projects have occurred here, and the last hope, the Esperanza, remains as an unfinished skeleton. But something grand will eventually arise at this site.. It also should impress the residents of Ocean Grove as a dream for a city with plenty of space to build and to park. This project is a cause for celebration over there—but you can see that, by comparison, the North End Redevelopment Plan is a mistake for Ocean Grove. Internet photo. Doug: No project has ever sold in a day; that’s sales spin. Yes, I’m a local broker.